... Money? Not likely in the world of Althéa. In other campaigns, one might find some gold or the odd gem, but the chances of such in Better The Demon will be slim. I am not saying it will be impossible, but extremely unlikely. On the other hand, I hope to make the contents of barrels to be more useful in other ways. I have already coded two types that can be found: The exploding barrel and the oil barrel. The atypical (yet quite typical in the fantasy world) exploding barrel, will be marked with the usual characteristic flaming emblem on its side. At the moment, its offers little more use than a potential threat to nearby enemies caught within its blast range than anything else, but it may be something I put to greater use in the future. The satisfaction of seeing one of these barrels blow up when attacked, however, is quite cathartic - even if it does take a couple of hits to break past its hardiness to resist such dangerous knocks or blows. The oil barrel, however, may be of more use to the adventurer. This is because this campaign will be using an adaption of Amraphael's Alternative Handheld Light Sources Pack, which contains lanterns. 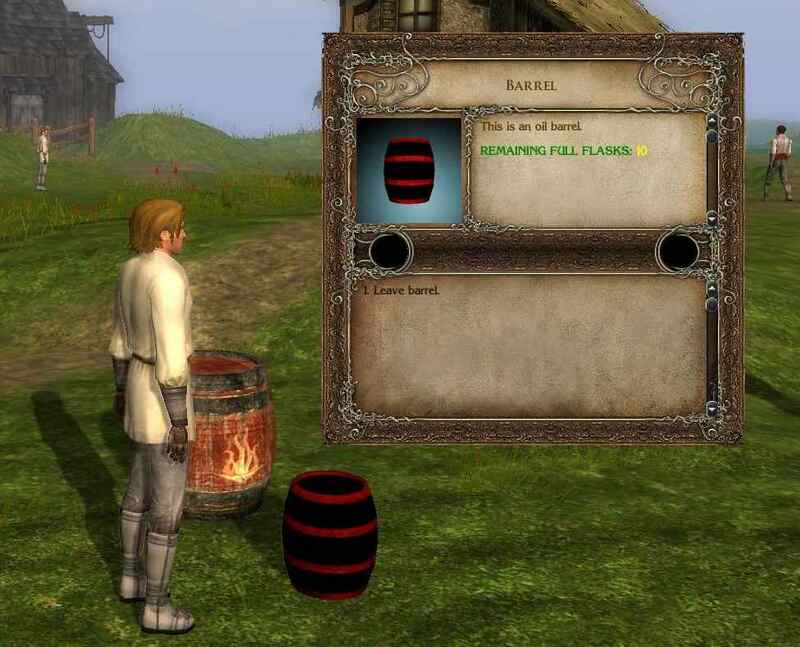 Lanterns have a longer burn time than torches and can be refuelled with oil if purchased or located in barrels such as these. Oil barrels start off with a random number of "flasks" of oil that must be gathered in flasks, which in turn can be used with the lanterns available in the module. 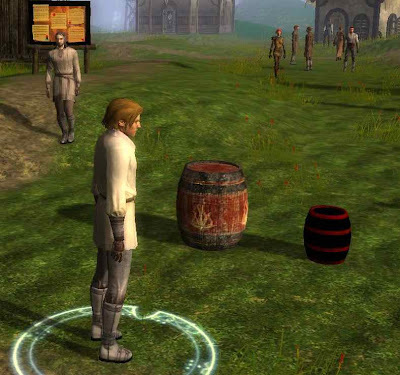 The player will know how much oil remains in the barrel when used. I have made it that oil must be gathered via a a flask before used with a lantern because a flask of oil can used in other ways as well as refuelling lanterns. A flask of oil can also be used as an oil grenade, keep a campfire burning, as well as one or two other ideas I have in mind. It's good to see that the latest poll has had a reasonable response already, after only one week. I have deliberately not gone into detail in my responses to date as I did not want to potentially bias other voters. However, when the poll is complete, I will make a more detailed analysis of the data then and add my own personal comments and preferences. In the meanwhile, if you have not voted, please do so, and add a comment if you wish. Every comment and piece of feedback do help me to understand what a player likes or dislikes and does (however slightly) help me to write in such detail and game play that may appeal to more players. An interesting point I managed to include among other things this week (in my opinion) was the ability to keep complete "open maps" hidden on the game map until the PC had moved closer to the area in question. It always frustrated me that a complete map of an area would be given to the player the moment they walked into the first chamber (unless blocked by a door). This, to me, seemed unrealistic, unfair and stole some of the "exploration" fun out of a game. So, by making use of a special "door blocker" object, I have now placed "doors" in hallways or passageways that would normally be open that means the player's map does not reveal that part of the map until the PC is close enough to the door, which then destroys it and allows the map to update. It's still a work in progress and does require a few more minutes placing these "doors" at build time, but the result (in my opinion) is quite good. Building continues in other areas. I am working on a new area, and Hosa has sent a couple of screenshots on his own work and hopes to do more this weekend. I am also working on conversations and general plot. Also don't forget the occasional barrel of mead or ale. Even the best adventurers sometimes need that little bit of liquid courage now and again. The exploding barrel is always fun thing. 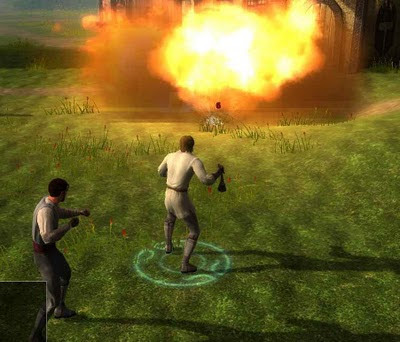 Will the player be able to move or place them for strategic advantage in battles or setting an ambush? One night when I was feeling a bit evil I placed an old exploding barrel in a set of underground ruins. The area is pitch black and after years the contents of the barrel have become rather unstable. Should an adventurer get too close with a torch while exploring the consequences are a bit on the bad side. I also was hoping for monkeys. But any screenshots makes a great post. The talk in the topic and the ensuing comments has shown me that people are putting a great deal of thought into torches. I have to ask why you think people even use them, let alone a lot?? Every single casting and divine class has a "Light" cantrip that is much brighter and doesnt waste a slot, and thats not to mention that 3/4s of the races have nightvision. I actually went out of my way to mention that cantrips have a light spell in my campaign intro room so that players dont complain about the dark areas. I have not yet decided whether I am going to allow the moving of barrels (of any kind). At the moment, I am edging towards them simply being placeables, but that may change in the future, even if it is a later campaign. Using torches/lanterns all depends on the flavour and design of the mod I suppose ... and whether a player even has a spell caster. I wanted to be able to allow as much freedom as possible in the module and so if a player wanted to use a human fighter, then they would need to acquire a light source. And a lantern definitely gives better light (and longer) than a torch. And if spells are harder to recover in the first place (which may be the case in this campaign), then even the spell caster *might* be tempted to use a mundane light source than use a spell to do so. And as much as anything else, simply adding the ability to do somthing like this (add fuel to a lantern) adds a element of detail to the module that is appealing to some players. It means there is more than one way to have a light source other than the spell. What else can you top up at a barrel station? Maybe holy water that is kept in kegs. With the system I am using, you can have any barrel supply almost anything you want (into an empty flask).